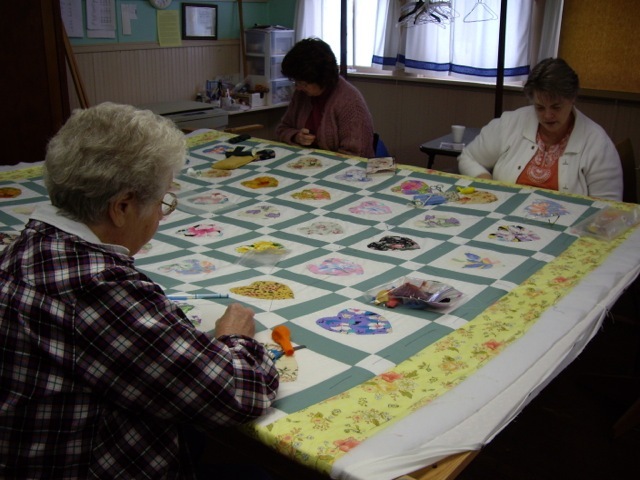 Things are moving quickly towards the end of the quilting season and the beginning of summer. We finished up the beautiful log cabin quilt that Cathryn had pieced. We even tied another quilt. And by this last Saturday which was Rendezvous and the Board of History Book Sale – there was nary a quilt in sight except the lovely one we are raffling off. People came into the old school house out of the rain to buy used books (and to warm up). Those of us working mostly sat around talking and occasionally making the piles of books for sale look more tidy. Darris Flanagan came by with copies of his new book about Trego. We’ve all been waiting to get a copy as we heard from Joan it might just be the best of all the books Darris has written so far. For me, I was basking in the wonder of these women who seem to get things done at such an amazing rate. Lynda was sorting out all kinds of Village paperwork before taking off to visit family for a few weeks. Cathryn made posters to advertise our Rummage Sale on May 16th. Bev is putting the ad in the paper about the sale. Cathy keeps the money we take in from events and donations sorted out. Having just returned from a trip, I was appreciative of all they give as volunteers to the Historical Village and how much they accomplish in a day. While traveling recently I had spoken with some people in their 60s and 70s who seemed to think their best years were behind them and that sitting in front of a television was enough activity for them on any given day. So it was an important reminder to me that there is always something in us left to give, that each of us can certainly find a way we can personally enhance our community, and that if we put our mind to it – we can improve with age. Aging doesn’t necessarily make us better but it can if we try. And with these women as my models, I am definitely going to try. I have missed too much Friday quilting this late winter and early spring. Its a sign that something is out of whack in my life. Fridays sitting around the quilt frame listening to the stories, listening to the laughter, listening to the silence is one of my favorite activities. So why is it that I let work or meetings or other activities pull me away? Because quilting with this group of women is such a pleasure that I have to earn it? Because quilting with them is the icing on the cake and first I have to deal with the cake or the meat loaf or whatever comes before the icing? Or maybe its just because I don’t have my priorities straight. I should draw a big star on my calendar on Fridays and not let anything else get written on that square. Because before you know it, May will be here and we will stop quilting for the summer. And then there will be three long months without the magic of sitting there stitching with these remarkable women. There will be other things….the museum will be open come Memorial Day. There will be Eureka’s Summer Festival and then July 4th and the Quilt Show in August and Shakespeare in the Park. All sorts of things fill up summer here in Montana between gardens and out of town guests and the long days that just call for lots to get done whether its hanging at the lake or making fresh rhubarb pie. 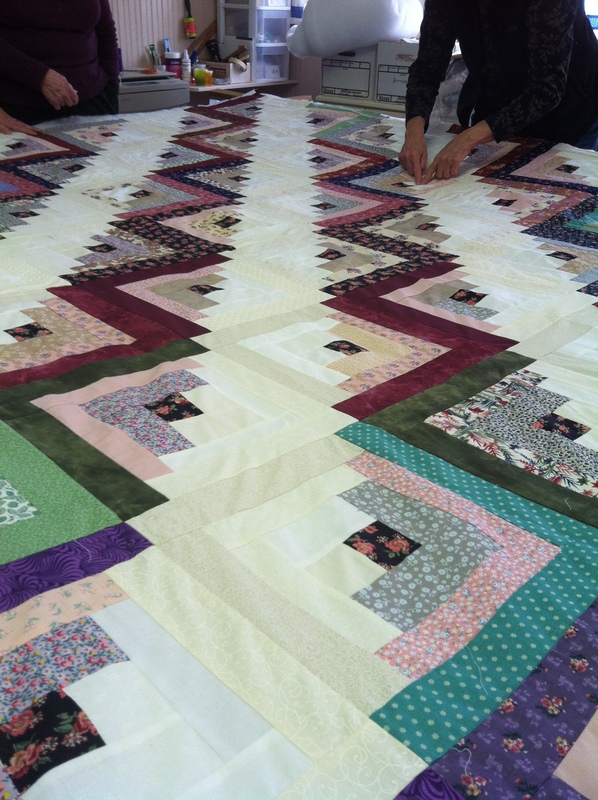 Good things – all good things but nothing has quite the timbre of quilting on Fridays in the old school house. We are finishing up a quilt that is lovely but requires concentration. A log cabin pattern that Cathryn made. But for some reason my camera wasn’t working so I decided since I can’t put in a photo of that quilt, I will put in a photo that shows Bonnie and Gayle. We’ve been missing them both as they haven’t been around for some months. Sometimes we miss them so much that someone will call Bonnie during our lunch break and we all take turns talking to her. This is part of the quilting. This is part of us stitched together.